The parish of Minera was created on 23 May 1844, from the townships of Minera and Esclusham Above, which until then had been in the parish of Wrexham. In 1865, "that part of the township of Bersham which lay west of Offa's Dyke" was added to Minera. In 1879, a large part of the township of Esclusham Above was transferred from Minera to the new parish of Esclusham. It is believed that there was a chapel of ease (to Wrexham) on the present site as early as 1577. 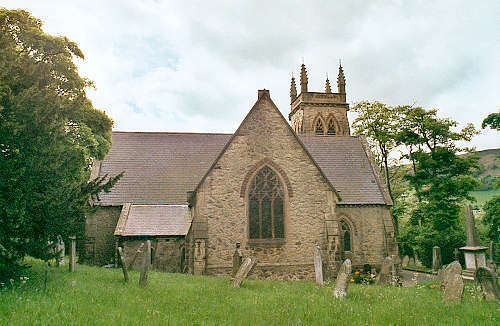 In 1730, the district was combined with Berse, which was also a chapel of ease to Wrexham; and this arrangement applied until Minera became a parish in its own right in 1844. The original Chapel was probably constructed of wood. It was reconstructed between 1728 and 1733; and a gallery was added in 1815. It was demolished in 1864, and a new Church was built in 1865, preserving the shape and interior of the old building. The new Church was opened in September 1866. For family history information about the church and parish, visit the GenUKI Minera page.